Located near the intersection of W San Mateo Rd and Pacheco St, Extra Space Storage serves residents of Santa Fe and Agua Fria. Locals will recognize our facility across from the San Mateo of Santa Fe condominium complex a few minutes south of Coronado Center. 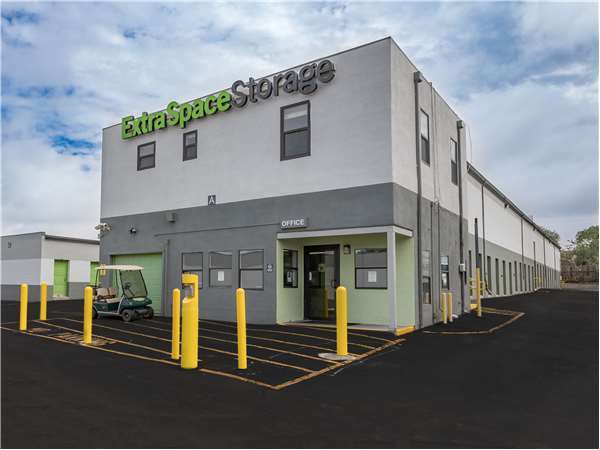 Extra Space Storage on W San Mateo Rd offers a large selection of storage units, vehicle storage, and exceptional security to accommodate residential and commercial storage needs in Santa Fe! With unit sizes from 4x5to 12x40 and convenient unit features like indoor access, stair access, and first-floor access, our Santa Fe storage facility can accommodate items large and small! Our W San Mateo Rd location has an on-site resident manager, 24-hour video surveillance, and electronic gate access to provide a secure storage environment for our customers and their belongings. Need secure vehicle storage in Santa Fe? Extra Space Storage has 8x15 to 12x40 outdoor parking spaces and 10x10 to 12x32 enclosed drive-up units that can handle vehicles from motorcycles to RVs! At Extra Space Storage, we care about delivering an exceptional self storage experience. From our secure, clean, well-maintained facility to our friendly, professional staff, we go the extra mile to ensure you get the high-quality storage solution you need. Contact us today to reserve a storage unit in Santa Fe! They did not have a salesy tone from the start. They were not attached to the outcome but rather had my best interest in mind. Allowed me to call around to other places without being pushy. When I figured out, after arrival, the unit I reserved was too small they worked with me to make the upgrade affordable. What a relief. Great facilities, super friendly, knowledgable staff. Super friendly service though sometimes understaffed. You may have to call more than once or go by to get help but once you do it's worth it! Everything you need, all in once place. Great loyalty programs! Friendly and helpful staff. Unit easily accessible. make the easiest move ever. with the most greatest ,friendliest people in the business. thank you. Extra space storage. Melissa, our storage unit specialist, is excellent at what she does. She was friendly, helpful, professional and knowledgeable. I am very pleased with my overall experience. Excellent experience, made finding and renting storage very easy. Great location, helpful staff. reasonable rates. If you have heavy things, keep in mind that it will be difficult to move them up a flight of stairs to the cheaper second-floor units. An elevator would be very useful. I live out of town and needed storage, I have used Extra St. before, but the folks at the 875 W San Mateo Rd, Santa Fe, we very very helpful in dealing with this. They made it simple and less stressful. Clean facility and they have security. Thank you extra space for providing excellent service. everyone was nice and helpful especially Thomas and Brandon at the front desk! They made it easy to get situated with the best storage options for me. i would do business with them again! I have a 10x10 unit, it is spacius and was very clean when i rented the unit. It is centrally located and the staff is great to talk with. Annie and Marissa were so helpful and kind. They had great advice on what size of storage unit we needed and great prices. I rented a 8x10 unit from extraspace and really felt like my items were in good hands and the staff was ever so accommodating, Offered me assistance with a appliance dolly to use as well as gave a coupe suggestions for local movers to help with my transition. I never would have expected all I got from the people at extraspace I highly recommend them. Wonderful expereince...Marisa worked with us and was very helpful in answering any questions. Great customer service. My entire experience was excellent. If I had a problem management immediately corrected the issue. Everyone was more than willing to go out of their way to help me. I have trusted Extra Space Storage has been with my "stuff" for going on three years. The grounds are secure and well protected and it is a comfort to me that they have earned my trust. The staff has changed some since I began to use their services, but I have always found the staff and their customer service to be helpful, courteous and friendly. Drive south on US-285/St Francis Dr. Turn right onto W San Mateo Rd. Turn right before Santa Fe Stone. Our facility will be directly ahead. Drive north on US-285/St Francis Dr. Turn left onto W San Mateo Rd. Turn right before Santa Fe Stone. Our facility will be directly ahead. Drive northwest on St Michaels Dr. Pass Wells Fargo then turn right onto CII Lorca. Turn left onto W San Mateo Rd. Turn right before Santa Fe Stone. Our facility will be directly ahead.